Development is an art…and a science. The process builds on a number of steps, with every activity serving as a prelude to the next. Although it’s true that you may successfully begin a development program starting anywhere in the process, chances of success will be enhanced by a carefully planned long-term strategy. •	Annual Giving – Includes programs like direct mail, memorials, donor clubs and special events which provide ongoing support to meet operational needs. They are the mainstay and foundation of the fundraising process. •	Planned Giving – Encourages the long-term financial stability of the organization while providing the donor with security and tax advantages. •	Capital Giving or Campaigns – Raise large amounts of money in short periods of time to meet capital expenditure needs for a construction project, endowment campaign or equipment acquisition. If the solicitation process by an organization doesn’t meet the above development definition, the activity being implemented is merely “fundraising” rather than development. Fundraising is project-focused instead of organizational in nature. Although it may be successful, project-focused fundraising ultimately results in a patchwork strategy rather than an integrated plan to address long-term goals and raise substantial dollars. Development is hard work that requires creative thinking and persistence. When implemented properly, it has the potential to bring great rewards to your organization. This excerpt was taken from "Capital Campaign Implementation: Are You Ready?" 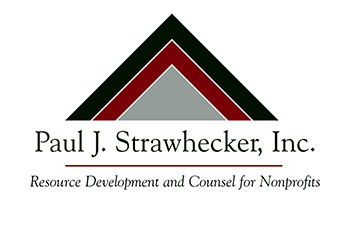 by Paul J. Strawhecker, MPA, ACFRE. Please contact us if you're interested in purchasing the book.